Crash looking an awful lot like Fake Crash for some reason, But it's good to see some Crash Bandicoot from you again! I've also made my self a tumblr account were it's going to be a art blog I've already put up pictures and i'am hoping more soon but one of theme is a crash one and is very much inspired of your design of Crash. this should the link to it. https://www.tumblr.com/blog/hazartsncrafts any keep the good work! This is an awesome sketch of Crash you drew! Speaking of which, here's a sketch of Crash I've done in Photoshop a few weeks ago using a pencil brush! What do you think? Cole MacGrath those are excellent sculptures! Very impressive art. 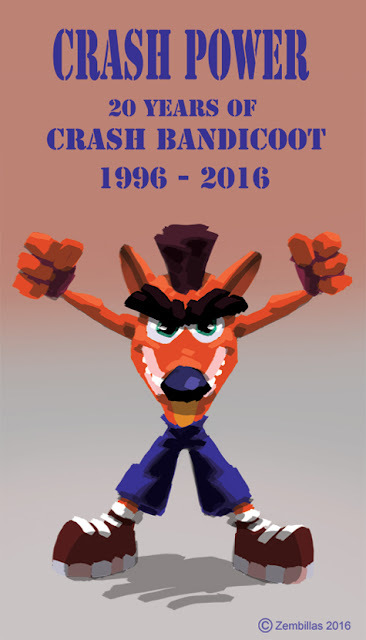 Hey there Pat that's a nice drawing of Crash! I like the confidence in your sketch. The Photoshop brush you used worked out well. I'll keep the link in mind and maybe use it myself at some point. Thanks for letting me know. Thank you Charles. It really means a lot to me for you to say that. I try my hardest to make these sculptures look like the characters. In fact i am planing on doing an Ripper Roo remake seeing on how people seem to really like that one. And I hope I'll be able make more crash sculptures in the future.But thanks again Charles! Thank you, Charles! It really means a lot coming from you! I liked how the initial sketch turned out. I put a lot of emphasis on the construction and gesture of the drawing which I think adds a lot of energy to it. I also like how the value of the pencil brush changes based on the pen pressure (I own a Cintiq which helps immensely). I looked at your concepts/designs of Crash you post daily on your blog as inspiration and reference while adding a bit of my own personal style (which I'm still developing). I think it all worked out in the long run. I'll draw more of Crash in the coming months. Thank you again, Charles! I really appreciate it! A original character created by my Friend "TheQueenofManga". This character is a mix with Jessica Rabbit and Morticia Adams. Hi Gribouille. You did a really good job with the animation. You're a very talented artist. Another winner Gribouille. Nice work!